Even with the coming elections, the need for real and effective change catalysts became greater. Many people try to find a place to sit in the government, promise or claim to create effective and lasting change in the country, but even as Filipinos hope for improvement, many are still doubtful and are frustrated. Naturally, individuals vent out and complain, but some to the extent of whining and not doing anything about the problems and needs seen around. But, what if there’s a better way to go about these problems? Like, instead of complaining, why not do something to create change? 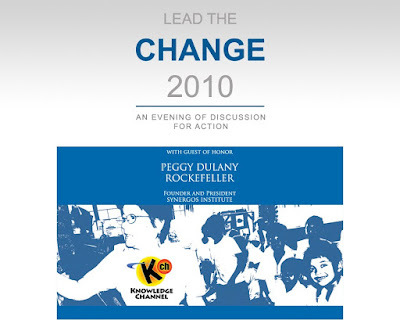 This Wednesday, February 17, 2010, a discussion-for-action event entitled “Lead the Change 2010” will be held at the Rockwell Tent. The agenda is to talk about how to make the country move forward. This event which was initiated by The Knowledge Channel will allow some of the most high-profile business, diplomatic and public officials to collaborate for basic education that is intentional with the goal of addressing the key drivers of poverty reduction: education, health, population, governance, environment, and peace. A possible thrust is to gain the support of influential people in the country to Help provide a public school with Knowledge Channel, one at a time. This is the better approach to solving the problems around us – to stand up and lead the change!